Fonda Cassidy with a Honduran child. 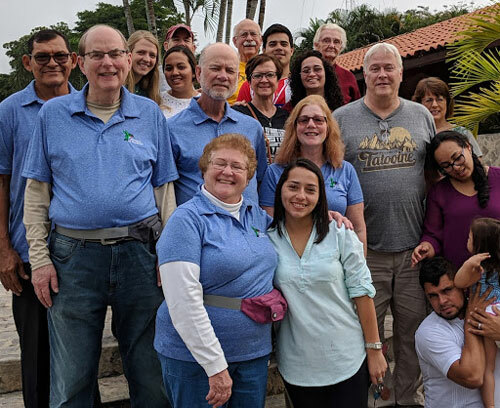 Robert and Fonda Cassidy traveled January 18-27 to Honduras to hold medical clinics in United Brethren churches. Robert and Fonda are from the Mt. Solon UB church in Mt. Solon, Va. Since 1987, they have participated in over 40 short-term mission trips, and have led 12 team trips. Over the years, they have led a number of UB medical teams to Honduras and Nicaragua. They now lead their own nonprofit medical mission organization, called Mission of Harmony. 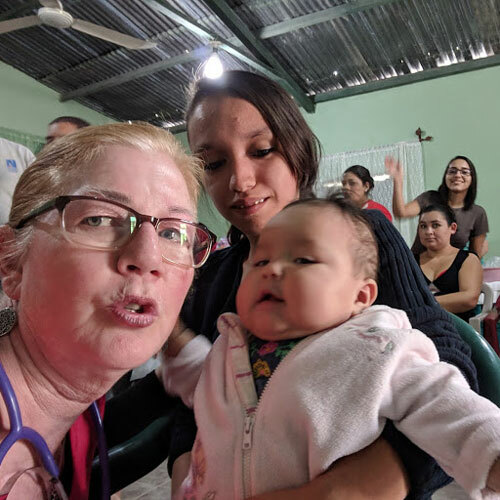 For this trip, they were joined by a team of 3 doctors, 5 nurses, a pharmacist, and 5 assistants who helped with the pharmacy, intake, triage, and other needs. They were joined by Honduran interpreters and their in-country coordinator, who was also from Honduras. They mostly worked in Santa Rosa de Copán, a beautiful area in western Honduras. They conducted four clinics at four United Brethren churches–at Santa Rosa Copan with pastor Jorge Pesquera; at Rios de Aqua Viva; at Roca de Salvacion with pastor Jose Geovany Dubon; and at Vida Nueva with pastor Erick Villeda.